What is the “Set System”? Why is it used in physical training? Finally, the answers to these questions and more! Have you ever questioned why the repetitions you use in your training are grouped together into “sets”? Has anyone ever explained to you just how and why they arrive at the number of “reps”and “sets” in their training? Or, has anyone ever explained to you which exercises should have high reps or sets and which ones should have low reps or sets? Confusing? Well, look no further! This is the book that will answer all your questions, and more. Young Tom DeLorme started lifting weights at 16 in 1932. After quickly becoming disenchanted with traditional methods of weightlifting, he set out to develop his own system of progressive resistance exercise. When World War II broke out, the shortage of hospital beds for injured soldiers prompted the need for speedier rehabilitation. This lead to the development of an accelerated exercise therapy based on heavy resistance exercise. DeLorme, by then an orthopedic surgeon, applied his methods with great success. Later, in 1951, Dr. Thomas L. DeLorme M.D. and Arthur L. Watkins M.D. published their findings in this book. A book so simple, forthright, and unassuming that it had only one edition and quickly disappeared into obscurity. The explanation for the age old mystery in modern day progressive resistance training is here. Order a copy today and quickly discover why this book should be in every weight trainee’s library. The physiological basis of progressive resistance exercise for muscular development. The inside secrets of how to use Muscle-Setting exercise. The relationship between velocity and tension during contraction. The importance of warming up and stretching and when they should be performed. How to use “The Overload Principle” to your best advantage while exercising. A complete guide to the variables affecting total work output. Learn the short term and long term effects of training on muscle, tendons and joints. Understanding the potential hazards of progressive resistance exercise. Common mistakes to avoid in setting your Repetition Maximums. How to determine the frequency of exercise to avoid over training. 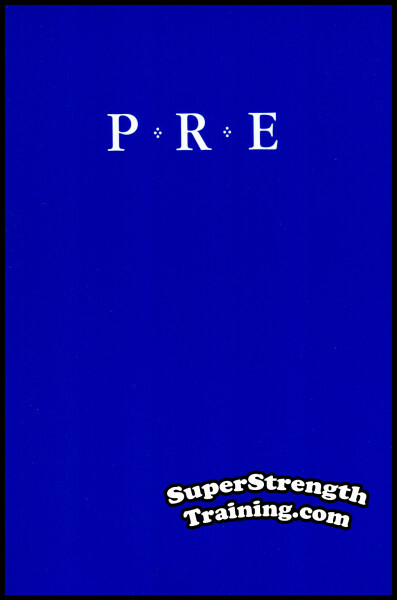 The use of PRE as a therapeutic treatment for orthopedic conditions. Discover why no athlete is capable of a record-breaking performance every day. The secret of “Counterbalancing” and how it can benefit you in your training. An introduction to Load-Resisting exercises and Load-Assisting exercises. P.S. A top quality 6 x 9 softcover book with 245 pages and 195 photos, tables and illustrations with a beautiful glossy color cover. Highly recommended! Order a copy of this ground breaking conditioning book today!